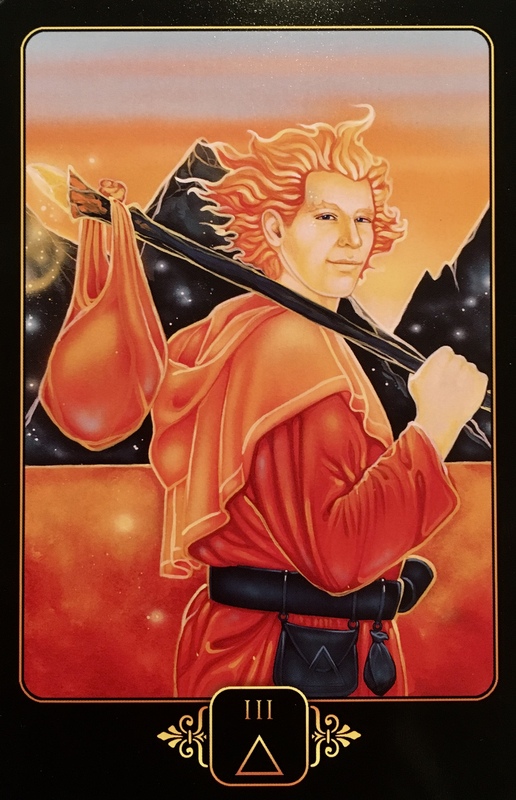 Card Meaning: “Do you have an idea or creative venture that you would like to implement? The Three Of Fire represents the necessary sacrifice that may be required when we act on our goals and objectives. When we first begin to act, we often find ourselves exploring the paths walked by those who came before us, in order to discover and determine the best way to implement our ideas. However, that same exploration can inspire new ideas that break with tradition, because something old has been re-imagined and expressed by a mind with a unique perspective to make it relevant in the present. To implement those new ideas requires sacrifice, commitment, and dedication. It means stepping away from what is tried and trusted, safe and secure, and stepping out into the unknown with an almost blind faith and commitment. It means putting the objective first, and turning away from everything that distracts, or might prevent it from being achieved. It means working hard, and not cutting corners in order to speed up the process. It means knowing that what you create will only equal what you have invested- and what you are willing to invest. Potential Blockage: “When the Three Of Fire appears as challenger, it represents a need to look closely at what you are doing. Watch where you are going. Do not allow yourself to fall, or trip, or become lost, because you are not paying attention. Remember your objectives and goals. Do not lose sight of them. Trust in your creative process… know that you are a well of ideas and information, and that you can trust what comes to you. It is ok to be inspired by others work, but add your own unique flair in order to be truly successful. When you use your own original ideas, you create something brand new, even if it is based on ideas that have been done before. You are capable of creating something that reflects your own heart and soul, and people will love and respect you for it. Listen to your creative process right now, as there is something important trying to come out. We may spend too much time comparing ourselves to others, and lose confidence by doing so. Now is the time to turn inwards, and let the creative juices flow. Pay attention to your dreams, they have special information for you at this time. Watch for signs and signals which lead you in new directions, as this will open doors and create new opportunities. Anything is possible when you put your mind to it… add your heart and Soul and magic is inevitable. Do not hold back!